On October 21st 2016, New Zealand Ambassador to Vietnam – H.E. 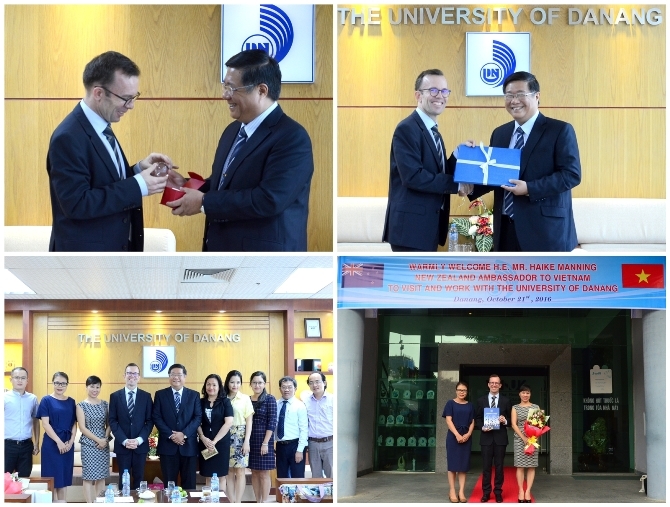 Mr. Haike Manning and the embassy officials visited and worked with leaders of the University of Danang (UD). Reportedly, this is the second visit of H.E. Mr. Haike Manning to UD. Representatives of UD at the meeting included: Assoc. Prof. Doan Quang Vinh - Vice President of UD, Dr. Le Thi Kim Oanh - Vice-Rector of University of Science and Technology, Dr. Tran Dinh Khoi Nguyen - Vice Rector University of Economics, Dr. Dao Thi Thanh Phuong - Vice-Rector of University of Foreign Language Studies, Dr. Huynh Cong Phap – Vice Rector of College of Information Technology and Ms. Ho Long Ngoc, M.A. – Vice Director of International Cooperation Department. At the meeting, Mr. Ambassador highly appreciated the development of UD over the years. Especially, Vietnam-New Zealand relation has many positive changes, facilitating cooperation activities between two sides. As a key regional university of the country, Assoc. Prof. Doan Quang Vinh stressed that UD strives to become a research-oriented university in 2020. Some major strengths of UD such as Information Technology, International Business, Finance, etc. are placed an importance to develop into international programs to improve the academic quality of human resources. On the process to become an international university, Assoc. Prof. Doan Quang Vinh said that 04 members of the UD has met the quality standards of education. This would be the first step for UD to expand international cooperation. As for cooperation opportunities between UD and New Zealand institutions, Mr. Ambassador shared that New Zealand has strength in agriculture, so it would be very suitable for research of UD’s campus in Kon Tum. Besides, Ms. Ho Long Ngoc proposed to receive New Zealand students for exchange and short-term study at UD, or implement educational projects between UD and universities in New Zealand in order to improve and develop the soft skills, language skills for students. With the role of an Ambassador to Vietnam, H.E. Haike Manning committed to continue to be a bridge between UD and New Zealand Universities, and support for the development and goals of UD.